If you thought it was easy to be the younger brother of NBA superstar Giannis Antetokounmpo, guess again. Alex Antetokounmpo, a star at Dominican High School, is trying to follow in his older brother's footsteps and play his way into the NBA. MILWAUKEE -- If you thought it was easy to be the younger brother of NBA superstar Giannis Antetokounmpo, guess again. 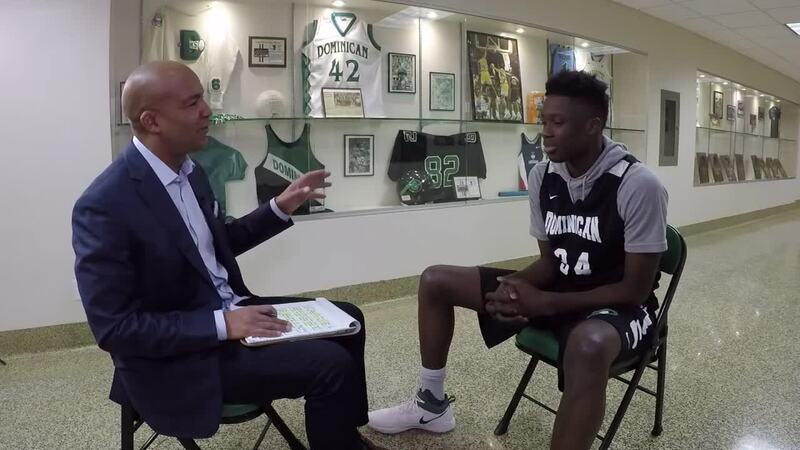 Alex Antetokounmpo, a star at Dominican High School, is trying to follow in his older brother's footsteps and play his way into the NBA. One of the first things that I asked him was about how tough it was making the transition from Greece to the United States. "It was hard coming from a different country, making friends, speaking the language," Alex said. "Plus the one get away was always basketball, and to be held back was pretty hard." But big brother Giannis has been helping Alex with his game, as well as showing him how an NBA player works out. He remembered one time Giannis taught him an important lesson after a game. "I saw him after the game and he gave me that look 'oh yeah, it's about to go down.' It was pretty late when we went to the gym. He turned the lights on, I went to the rack with the balls and grabbed a ball. He said 'no, no, put that back.' I went upstairs to go on the treadmill, ran for a while, went on the shooting machine, and he walked me through a lot of mental stuff," Alex said. "We went through some film. It brought up my confidence, and he told me that I was built to do this." The two brothers live together and are very close. Giannis goes to a lot of Alex's high school games when he's not playing for the Bucks. But when the two brothers are at home, Alex beams at his brother. "Sometimes you have to stop and realize what you got at your house, you know? Some days I'm so starstruck, but sometimes I have to stop and realize that he's my own brother and realize how great he is and what he's able to do."